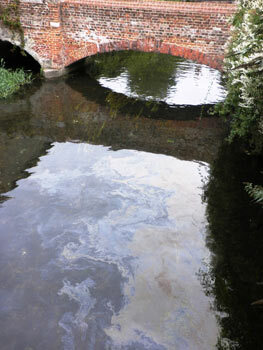 Spilt oil can pollute streams, rivers and, if it soaks through the soil and rock, groundwater. In the UK our drinking water supplies come from rivers and groundwater. We must protect them both from pollution. Oil is toxic and harmful to plants and animals and a threat to their habitats. Over the past five years oil has consistently been among the UKs top three pollutants. Many drains lead directly to rivers, streams or lakes, and if you allow oil to enter a drain it can have the same effect as you pouring it directly into a watercourse. 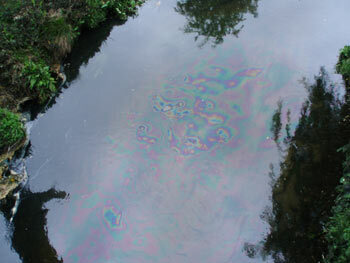 Just 1 litre of oil can contaminate 1 million litres of water. Wildfowl are particularly vulnerable, both through damage to the waterproofing of their plumage and through eating the oil as they preen. Mammals such as water voles may also be affected too. In the ground and soil oils coat or kill the organisms which are necessary to maintain the environmental balance. It’s not just the effect oil has on wildlife; oil contamination can make water unsuitable for irrigation and damage how water treatment plants work. Oil spills can make drinking water sources unfit for use and is very expensive to put right. If oil is spilt near to a building the oil vapours could enter the building making it unsafe for habitation. This could mean the building becomes unusable until expensive restoration work is completed, or in extreme circumstances the building may need to be demolished. If this is your home or place of work this can be devastating. See what could happen to you if you don’t look after your oil. It’s against the law to cause pollution so you’ll have to take action to clean up any serious spill or leak. Your insurance company may not pay if the leak has been going on for a while or if it was caused because you didn’t follow good practice guidance. We recommend you check your tank and pipework regularly and monitor how much oil you use so you can spot any sudden changes and take action.